Kodubale/kodbale is the specialty of karnataka. My mother makes excellent kodbale and I want to share her recipe with you all. Heat the pan on medium high. Put fine sooji and maida/all purpose flour, and fry it until it becomes slightly warm. Transfer this to a bowl and add a tablespoon of oil. Mix it well. Leave it aside and grind the coconut and chillies. Once you are done with grinding, add the ground paste, rice flour, salt, hing, and ajwain seeds to the rava/sooji and maida mix and mix it well. Now the kodubale mix is ready. Now heat 3 tablespoons of oil in a ladle, add this hot oil (when you put this oil on the mix you have to hear the sizzling sound) to the prepared kodubale mix. Once the oil has cooled down slightly, mix well. Now add water little by little, mix gradually and prepare the dough. Keep the oil for frying on medium high heat. In the mean time, we will get ready with preparing the rings. Take around a lemon sized piece of dough, gently roll on a flat surface to make a thick rope shape, and join at the ends to make it as a ring. Prepare 6 to 8 rings and keep it aside. 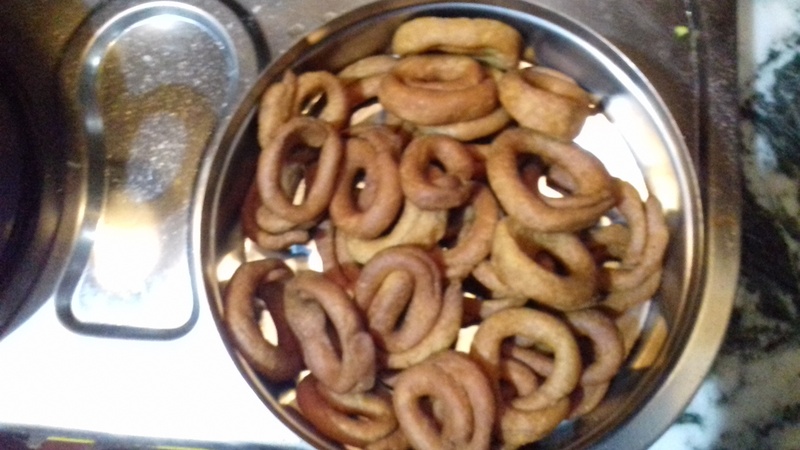 Once the oil is hot enough (to check, put a little bit of dough in the oil, it should come up immediately) to fry, add the prepared rings one by one. After around 5 minutes, turn the kodbale/rings to the other side to cook. 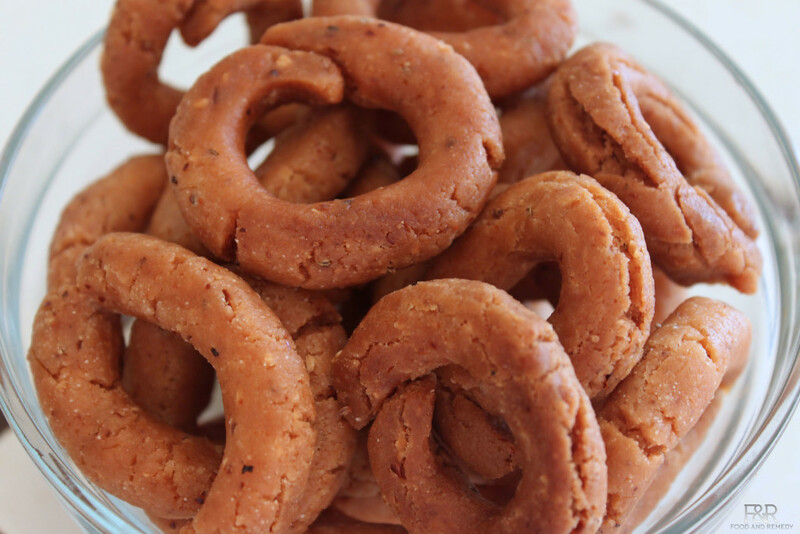 While waiting, prepare rings with the remaining dough. Both sides should get the desired brown color, and bubbling should stop. It may take another 4 to 5 minutes for the kodubale to be fried completely. Once the kodubales become brown, take them out and put them on a paper towel. Once the kodubale have cooled down, store them in an airtight container and enjoy this yummy snack with coffee or tea. Tip: Always fry in a medium heat for the best Kodbale. Please checkout another famous authentic snack, Nippatu. Why is my Kodubale not coming out crispy? The reason for not getting crispy KodubaLe could be,high heat. Try frying in medium heat until all the bubbles subsides. It will make the kodubales to evenly fry both inside and out. What type of chili powder do you use? The color looks rich with your kodubale. We use Badayagi chilly chilli powder. Not only does it give a good color, but the aroma will also be excellent. I am using a non stick wok (bandale or karahi)? Is that okay? We prefer cast iron wok since the heat retention and distribution of heat is way better in a cast iron wok (bandale or karahi). Seeing only got water from mouth. Lot of good articles it is helping us a lot. Looks amazing ..will definitely going to try that .Thanks for the recipe, looking forward for such more in future. Please do try and give me your feedback. Excellent and yummy snack Raji!! My favorite snack.will def try!!! Try it and let me know how it turns out Prafulla! Hello, thank you for this recipe. Wanted to know are we OK to use dried coconut instead of fresh coconut. Thank you so much for sharing this click! GLad to know your daughter likes Kodbale ! hmm…Never happened ! I have done this 100+ times , did you follow this recipe? My suggestion you can add either rava or rice flour to the dough mix it and make, it should work.